Universitatea de Vest “Vasile Goldis” Arad involved in the fight of the breast cancer. As project partner within the project no. HURO/1101/189/2.4.1 entitled “Development of Infrastructure of Regular Mammography Screening in Hodmezovasarhely, Szentes and Arad”, funded within Hungary-Romania Cross-border Co-operation Programme 2007-2013, Universitatea de Vest “Vasile Goldis” Arad acquired high quality medical equipments in order to achieve the main objective of the project – to mitigate the mortality rate of breast cancer in Arad. Through the purchased equipments, given that they were provided with a particular network, will be able to communicate with the other similar equipments (provided by Hodmezovasarhely and Szentes), so both doctor teams (of the two neighboring countries) will be able to obtain resolutions, when needed, concerning consultations performed by doctors from neighboring country too. Likewise, have been achieved communication and dissemination events of the project, so was organized a visibility action entitled “Impreuna fara frontiere impotriva cancerului mamar” (Together without borders against breast cancer), in wich, some of the participants, in solidarity of those affected by this disease, performed a human bow (as a symbol of breast cancer) and also must be mention that it was organized a joint bycicle tour, as a call to a healthy life, cyclists (emblazoned with the signs of the project) who succeeded to make more visible participants demarche within the event. The development of the mammography screening unit of the hospital of Hódmezővásárhely has been carried out, meaning that the first 3D unit of this kind was opened in the country; the screening unit facilitates the recognition of early stage breast cancer. The mammography screening unit was acquired in a development of 660000 EUR; along with the screening unit the acquisition of digital ultrasound devices and a picture archiving and communication system also happened, as well as the rebuilding of the mammography screening area. The development was necessary as due to the new screening model developed by the EVP the demand for screenings increased. As a part of the HURO program a training took place in Hódmezővásárhely for two whole days for the assistants who work with the mammography screening units. Public Cycling Event in Szentes A Public Cycling Event took place in Szentes to raise awareness to breast cancer and the importance of screening (See gallery). This year more than 500 participants cycled in Hódmezővásárhely to raise awareness to breast cancer and the importance of screenings. They departed from the main square, Square Kossuth and cycled 4 kilometres in town. Mr. Balázs Rozványi from the Hungarian League Against Cancer emphasized that while the national average of screened women is around 40%, in Hódmezővásárhely it is an exceptional 70%. The mammography screening area of Szentes is renewed (See gallery). Within the Hungary-Romania Cross-Border Cooperation Programme (HURO) 2007-2013 „HURO/1101/189/2.4.1 (DIMS) the mammography screening area of Hódmezővásárhely will be renewed, while new devices are acquired, like the new 3D mammography screening unit, ultrasound devices and a picture archiving and communication system. This is the sixth year that the screening bus of the EVP departs to screen the women of small settlements of Csongrád, Békés and Bács-Kiskun Counties. In this year the operation of the screening bus is supported by the Hungary-Romania Cross-Border Cooperation Programme (HURO) 2007-2013 HURO/1101/189/2.4.1 (DIMS). 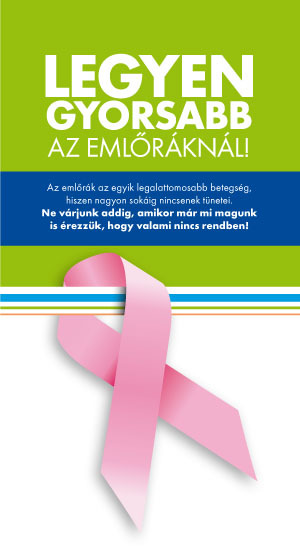 An international professional conference, with the title of „Interdisciplinary Conference on the Diagnosis and Treatment of Early Stage Breast Cancer” was held at Hódmezővásárhely in January 2013 to provide training to doctors to recognize early stage breast cancer. The main presenters were the world-famous Hungarian-born Professor László Tabár, M.D. F.A.C.R. (Hon), Corse Director and Tibor Tot, M.D., PhD, Chairman, Dept. of Pathology from Falun, Sweden. The Vásárhely Health Programme (EVP) of the CSMEK Hódmezővásárhely-Makó, Hódmezővásárhely won a tender together with the Dr.Bugyi István Hospital of Csongrád County, Szentes and the Vasile Goldis University, Arad for European Union financial sources in the Hungary-Romania Cross-Border Cooperation Programme (HURO) 2007-2013 „HURO/1101/189/2.4.1 (DIMS). In the programme 1.8 million EUR were allocated to the three regions, 852 000 EUR to Hódmezővásárhely, 530 000 EUR to Szentes and 400 000 EUR to Arad. Their aim is to make the fight against breast-cancer more effective in the Hungarian region as well as across the border in Romania, thus with new and proper infrastructure, the affected women can be reached more easily.